Parchment : 2 sheets 40cm x 26cm signed and stamped. The Rev. Edwin James Bromley KINGSTON of Norton in the Moors, Staffordshire. The Rev. Edwin James STURDEE of Brown Edge, Norton in the Moors, Staffordshire. John William DEANE of Norton Green, Norton in the Moors, Staffordshire. William Edward SLACK of Wood House Lane, Brown Edge, Norton in the Moors, Staffordshire. Miner. George REDFERN of Brown Edge, Norton in the Moors, Staffordshire. Miner. William HOLDCROFT of Bradeley, Norton in the Moors, Staffordshire. Collier. (died 1909). 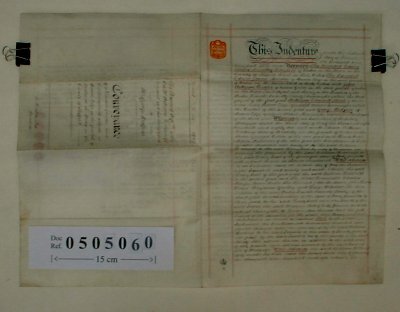 The document begins by reciting an Indenture of 1882 in which William Holdcroft borrowed £40 from Henry FROST on the security of property at Brown Edge, Norton in the Moors, Staffordshire. Then in 1890, the mortgage was transferred to the Norton Female Friendly Society, and at the same time William Holdcroft borrowed a further £20. William Holdcroft died in 1909 with William Slack as his Executor. William Slack is now selling the property to George Redfern for £110, of which £60 is used to repay the mortgage (we are not told who are the Beneficiaries of the other £50). The property consists of a dwelling house with garden and croft of land containing 2 roods and 25 perches at Brown Edge.